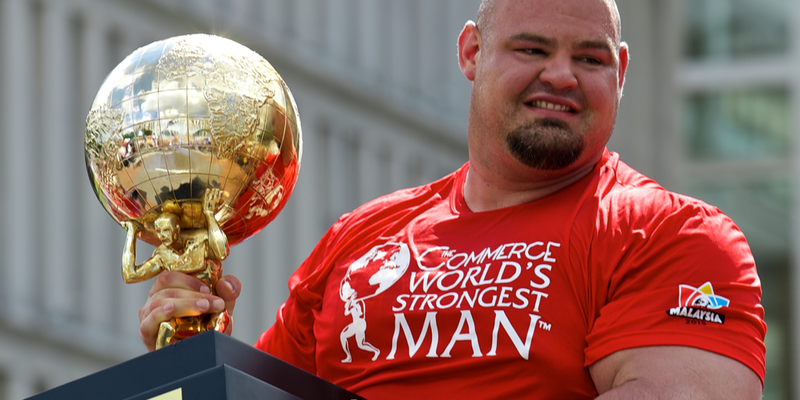 Congratulations to Brian Shaw, Winner of WSM 2011. Brian beat the best from around the world to clinch the title of World’s Strongest Man. BVP: Hi, I am sitting here with World’s Strongest Man competitor and 2011 World’s Strongest Man winner, Brian Shaw. I first met Brian at the Liberty Classic Strongman Competition in Philadelphia in 2010. He was quite impressive with his physical prowess, athletic ability and over all static strength. So Brian, what was your height/weight at the World’s Strongest Man 2011? SHAW: I was 6’8″ and 415 lbs. BVP: Is Strongman your job…vocation? SHAW: Yes, Strongman is my main job. Depending on how busy I am I also will train people part time but lately I have not had time to train anyone. I also run my personal website www.shawstrength.com where I sell several things including custom atlas stone sleeves that I personally make. BVP: That’s really great Brian, I guess that sort of makes my next question…irrelevant Ha! But I’ll ask anyway…A lot of European athletes make a living just doing Strongman, why do you think that is not the case here in the United States? SHAW: I am living proof that is possible to make a good living just doing Strongman in the USA. I do have other things that I do but I am lucky enough and good enough that I can earn enough money from competitions/sponsors/appearances/etc. during the year to be very comfortable just being a professional Strongman. 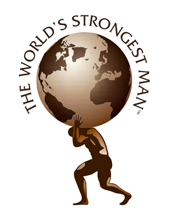 Were you always interested in Strongman and how did you get into the sport? SHAW: I have always been interested in Strongman and always watched it growing up when I could. During high school and college I developed a real love of training and lifting weights while trying to get in better shape for basketball. When I finished my basketball career after college I needed another way for me to compete physically and Strongman fit perfectly for me with my love of lifting and training. I entered my first contest here in Colorado in late 2005 and never looked back! BVP: I’m still trying to grasp the concept of you playing basketball…it’s quite the visual, needless to say you were a tad lighter back then…How long have you been active in weightlifting? SHAW: I started lifting weights after my junior year of High School and have been lifting weights since then. I have been very committed to training over the years and I am proud to say that I have very rarely if ever missed a training session. I believe the constant training over the years has really helped me to get to where I am now. Being strong and being a Strongman is not something that you can do part time or only when you want to….it has to be a lifestyle and for me it is a huge part of my life. BVP: I imagine if you want to “play” at the Big Show (WSM) you can’t do it part time and expect to have success…definitely makes sense. What was your first contest? SHAW: My first contest was Denver’s Strongest Man in October of 2005. I earned my pro card at Utah’s Strongest Man in 2006. My first pro contest was the All American Strongman Challenge at the Fit Expo at the beginning of 2007. Your Strongman career has been a pretty rapid climb, being in 4 Worlds contests in a 6 year career….what would you attribute your success to? SHAW: I attribute my success in Strongman first to my God given abilities and size because without that I would not be where I am now. Secondly I would say that my work ethic plays a huge role in my success in this sport because I work very hard to develop my abilities. And lastly I would say that my knowledge of training and my ability to figure out new and better ways to train for Strongman and to train on my weaknesses plays a factor as well. BVP: What is your most memorable contest and why? SHAW: I would have to say that I have a lot of great memories from the contests that I have done over the past few years. I have had a lot of good performances and accomplished a lot of great things but if I had to choose one contest it would be the 2011 WSM. Winning my first WSM title and getting my first WSM trophy is something I will never forget! SHAW: I think the only way to prepare for this event is to pick up a stone or sandbag and to go as far as you possibly can. There is no way to teach yourself to fight for the last few steps unless you put yourself through that in training. SHAW: There are a few different things I do to train stones depending on the contest I am getting ready for. I will normally rotate between lifting heavy stones one week and then doing more speed work or speed runs with lighter stones to teach myself to load stones quickly. SHAW: It will depend on if I am training for reps or max weight but normally I will rotate so that I don’t do the same thing every week when getting ready for this event. So in other words if I am getting ready for reps I wont just do max reps each week I would break it up and one week do sets of 3 or 5 and then come back to reps the following week. Same thing with training for max weight as I don’t do my max weight each week. I will instead work my way up each week in a training cycle. SHAW: This event is becoming a lot less popular in recent years due to the high number of injuries seen on it. I personally really like tire flip as I think it is a good event. It is a good overall test of body strength and training for it requires doing tire flips to get the technique right. SHAW: A very popular Strongman event! The easiest way to train for this is to either get a car deadlift frame to train with or to find someone who does have one and borrow theirs. I think having a good squat and a strong back will carry over to car deadlift very well. SHAW: Training for The World’s Strongest Man is very tough because we don’t typically find out the events until there is not enough time to train for them so most of all you just have to try to be prepared for everything that you might have to deal with at the contest. Outside of that I always just try to focus more on what I feel are weaknesses for me and I train those things harder leading up to WSM. BVP: Ha!, so you don’t know the events until a couple weeks out. That’s tough, but as I’ve always been told..and now tell people…”well…it is Strongman…figure it out” (laugh) …As you approach The World’s Strongest Man how does your training differ 2-3 weeks out? SHAW: At 2-3 weeks away I hopefully know what events my group will have as well as the events for the final. I like to set up a 100% training “contest” at approx. 2 weeks away from the actual competition with 100% weights. After that I start to back off my training and train lighter the following two weeks so that I show up to the contest well rested and ready to go. BVP: Do you incorporate cardio into your training? SHAW: I don’t really incorporate cardio into my training other than with training the events like loading/carries/clean and press for reps, etc. It is my opinion that cardio won’t really carry over to Strongman that well because of the specific event disciplines and therefore training those disciplines will better prepare you for competition. BVP: I guess, doing your anaerobic work, like medleys and the ones you mention get the heart rate going pretty well. What does your basic diet consist of? SHAW: I have started working with Nathan Payton for my diet planning and so far it has really helped me. I have cleaned up my eating (not that I was eating bad before) overall and feel like I am getting stronger all the time. My basic diet consists of a lot of lean meat chicken, beef, buffalo, fish, etc. and a lot of carbohydrate mixed in with fruits and vegetables spread over 7 meals throughout the day. It is a ton of work cooking and eating all of the food but I look at this as part of my job and in all honesty it is basically like a part time job with eating and cooking taking me almost 3 hours a day with most of that time spent simply chewing and swallowing food! BVP: That’s very interesting, and at over 400lbs, you must eat huge volumes of food, I can see how that would be time consuming just eating! Do you change your diet as you get closer to a competition? SHAW: Yes we do make slight changes in order to help me peak closer to a contest. BVP: What’s your theory on rest and recovery? SHAW: Well I am a big fan of learning to listen to your body with training. There is a fine line you have to walk down with training leading up to a big contest and being able to know when to push harder and when to back off a bit is very important. That being said rest and recovery is very important in the strength building process and I try to get as much as I possibly can when I am pushing myself hard in training. BVP: I’m constantly fighting with people I train with about rest and recovery it’s so important, just as much as the actually training itself. If you could eat anything you wanted what would it be? SHAW: Luckily I do get to have cheat meals every so often in my diet so that helps me stay on track but my normal “cheat food” is ice cream. Well, that is it for the questions. I want to thank you Brian for taking the time to answer all my annoying questions (laugh). I know you are a very busy man and I’m sure I’ll be seeing you again. Take care and stay strong! SHAW: No problem Barry, it’s always a pleasure to speak with you.